Did you know that a little conflict in your office today can shut down your entire operation tomorrow? That is no exaggeration! Workplace conflict costs. It starts by reducing productivity and employee health. It will finish your business by reducing customer loyalty and profitability. In this self-paced course you will learn how you can avoid conflict from developing, and methods you can use to resolve conflicts that are occurring and affecting your workplace. Enroll today and learn how to put a stop to it now. Conflict is a disagreement between two or more parties. Although the dictionary may assert that the word "conflict" is synonymous with the word "fight," practical usage suggests that there is a difference. "Fight" suggests a combat - perhaps a conflict that degenerates into two people punching each other. "Conflict" - in a business setting - suggests less physical activity. Both can be harmful, however, to the people engaged. Conflict can arise over the slightest thing in a business setting, and can escalate into a major confrontation between several factions. Although nations, businesses, churches and families all participate (and succumb) to conflict, we will primarily focus on the conflict that can occur between parties in a business setting: Specifically, we will be looking at conflict that happens within a company. You may be involved in a conflict in your family or church - two common places where conflict can also occur - and you will get something out of this material. However, please be aware that it is primarily designed for business conflict situations. If you are experiencing conflict between your business and a vendor, or your business and a client, you will also find this content useful, but it may not all apply. Take away what you can from this course, if that is the case. This list may seem long, but there are, in fact, hundreds or even thousands, of other factors that can play a significant part in our attitudes and assumptions. With every interaction we make, whether it is buying gum at a convenience store, getting pulled over for a speeding ticket, negotiating a pay raise with our boss, or going out on the town with some friends -- how we act is defined by how we think; and how we think is defined by our attitudes and assumptions. Real-life example: One woman was attacked by a dog when she was a child. Although there was no permanent physical scarring, she was emotionally scarred. From that point on, she never liked dogs, whether big or small. Even as an adult, she would show fear around some of the smallest dogs, even though they could not hurt her. The memories she had affected her world view. Real-life example: One boy was raised with a very strict father. Although never abused, the boy was disciplined strictly. The boy grew up, and when he became a father, he vowed to never raise his child like he was raised. As a result, he gave his own children little discipline and they became very rebellious. His background and his attitudes about discipline affected his world view. Depending on where the person is, they will have a different view of the cube. 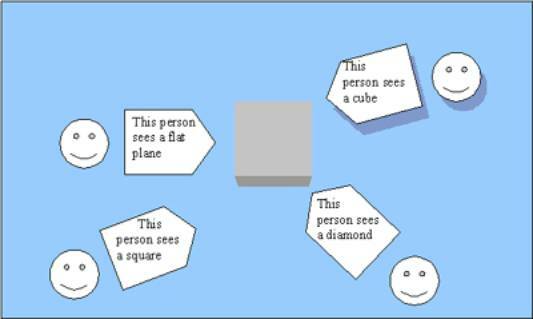 One person sees a flat plane, because they are looking at the cube straight-on. Another person sees a square, because they can perceive more than one angle and can make some assumptions. A third person sees a diamond, because they are looking at the square at exactly the angle that makes it appear to extend out from a low point. Lastly, another person, who is a little higher up, sees several angles and realizes that it is a cube. Exercise: Ask a group of friends to (individually) tell you about a movie they have seen. Do not let them hear the other people's interpretation of the movie. You will get a variety of viewpoints: Some people will focus on the plot; others will focus on the characters or relationships; others will talk about specific details; still others might describe some of the more exciting moments of the movie. In all, you will quickly learn that everyone can spend two hours watching the exact same movie, but no one will ever truly see the same movie. As a result of our differing world views, we have conflict. Each world view informs our work ethic, it builds assumptions for us, it helps our decision-making skills, and it helps us to understand concepts and ideas. Unfortunately, since everyone's world view is different, our work ethics will be different, our assumptions will be incorrect, our decision-making will not be the same as other people's, and we may misunderstand (or differently understand) the same concept. The more people you add into the mix, the more likely there will be conflict. and the more likely that conflict will be prolonged and intense. The first half of this course will primarily address the first type of business conflict -- horizontal conflict -- and will address it to all numbers of people, from one-on-one, to groups-on-groups. Some of the principles you learn here will apply to the vertical conflict, as well as outward conflict and inner conflict. This course will help you to analyze the conflict, design ways to resolve it, and promote methods in your business to avoid conflict altogether. Ultimately, conflict needs to be resolved; it cannot simply be ignored in the hopes that it will go away, because the conflict itself may fizzle out in time, but the underlying emotions and attitudes remain and will act like a poison in your company. The first step is to analyze the conflict. When you detect a conflict is in place, it is (unfortunately) too late to avoid it (which is something we will also cover in this course). When conflict arises, it needs to be dealt with. 1. Am I involved in this conflict in anyway? This includes being a direct participant or being influenced by the outcome of the conflict itself. 2. How am I affected by the conflict, or its outcome? 3. What is the task that is supposed to get done during which the conflict has arisen? (Perhaps it's a group that is meeting to develop a new service, and they can't decide on the service, or maybe the conflict arose simply during the course of normal business practice). 4. Who are the people directly involved in the conflict? On what sides do they fall? 5. Is this conflict a horizontal, vertical, outward, inward, or mixed conflict? 6. What are the main points of each side of the conflict? It may come on you to mediate. Sometimes conflict requires one of the members of the conflict to mediate, and sometimes a neutral third-party mediator needs to come in. If you are going to mediate, you need to be very honest and clear in your influence over the results of the conflict. If you are influenced at all -- in any way -- you may still be able to mediate, but your position as mediator is greatly disadvantaged by your own world view. Conflict is a disagreement between two or more people and it is the result of differing world views. There are many types of conflict, but in a business setting, there are typically types: horizontal, vertical, internal, external, and mixed. These types of conflict can be between one person, or several people and another person, or several people -- that is, between individuals or groups. It's important to understand the best ways that you can help to resolve conflicts in your office. Believe it or not, a little conflict in your workplace can actually shut down operations until the situation is resolved. Its important to understand how conflict resolution works so that you can help your employees and your customers engage in a more rewarding experience. Conflicts in the workplace cause a loss in productivity and even employee health. Studies have shown that working in stressful environments weakens the immune system and causes undue mental pressure on individuals. No one is perfect and there are always going to be issues that need to be resolved. This course will show you the best ways to handle tough situations and will show you how to eliminate animosity and anger, as well as tone down frustration levels. While conflict is fun to watch in television or in the movies, when its a part of your work life, its definitely not entertaining and it can have a serious toll on your emotional well-being and your general health. Don't put it off any longer. Learn how you can best handle the conflicts that will arise and how you can walk away from stressful and tense situations without losing your temper or your self-respect. You'll discover that you have the ability to make changes you never thought possible and you'll find yourself in a working environment that functions smoothly, efficiently, and without stress making it a great place to be. 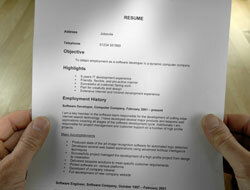 Applying the same techniques that are taught by major corporations, the student will be able to more effectively operate in many workplace environments. There is also a forum community within the course which will create a brainstorming and creative avenue for the student to expand and excel. In addition, students will have the opportunity to interact with their professor during designated periods so that any questions they might have can be effectively addressed. Understanding the types of conflict: Students will discover the various different types of conflict that are out there, as well as get to the reasons that it occurs so often in the workplace. Students will also be given different solutions to the various conflicts they might encounter. These solutions are real world solutions and not textbook examples that serve no purpose outside the classroom. The consequences of conflict: Students will see the consequences that happen due to conflict, ranging from personal costs through workplace costs and including legal costs. Secrets of conflict resolution in the workplace: There are eight steps needed to resolve conflict and the student will be shown each step as well as how to arrive there. This course will help give you a conflict resolution game plan. In case of emergency: As anyone knows, there is no guaranteed method for conflict resolution and there are cases when a resolution is not going to work. The student will be shown how to deal with that situation. The secret of positive communication: The student will be given the knowledge and the techniques necessary to facilitate positive communication. Since many conflicts can be avoided with the right tools, the student will learn how to best approach individuals who might be having problems and assist them without a conflict taking place. As more and more businesses are looking for ways to help their personnel perform better and are seeking ways to keep the workplace as stress-free as possible, this course is invaluable. Whether you are a junior member of a staff or a senior manager, the techniques and tools that you will learn here will assist you in achieving more success and more responsibility in your job and youll also be picking up tools that can be used outside the workplace, as well. We live in a world that has enough conflict in it and you can do your part in making sure that problems are solved even before they start. Complete: Assignment 3: How Would You Now Resolve a Conflict? Describe the types of conflict that occur in the workplace. Describe the consequences of conflict in the workplace. Know procedures to resolve workplace conflict. Know steps to take when conflicts are not resolved. Know ways to stop conflict from arising in the first place. Define why people conflict in the first place. Describe the most common techniques to resolve personal conflict. Describe ways to mediate conflict between parties. "I thought the descriptions of different types of conflict were very helpful. I also enjoyed the lesson that gave resolutions to the conflicts....The instructor was very nice, and was quick to grade my work. I appreciated his input." 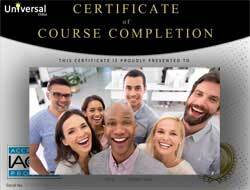 -- Ericka M.
"My first class on Universal Class though hardly my first course Online (lifetime learner, here). I really enjoyed it. The instructor set it up very nicely and was quicker than any instructor I have ever had with evaluation and feedback; which is why most of us are here. Anybody can study independently, but you do not get evaluated or graded which is what makes you work harder and strive for perfection. No secret there. Can't have a drill team without a drill sergeant. 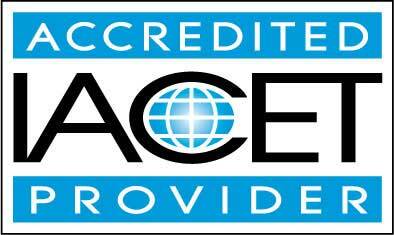 A+ for CR 101 with Instructor Matt Coburn Great Job!!!!!!!!!!!! Great Site!!!!!!!!!!! I cannot wait for my next class" -- Stewart D.